I’m a big soup fan and always up for trying a new recipe so when I saw this I had to try it. It’s a nice change from your standard vegetable soup and accompanied with flatbread can make a nice, filling evening meal with a small amount of calories. 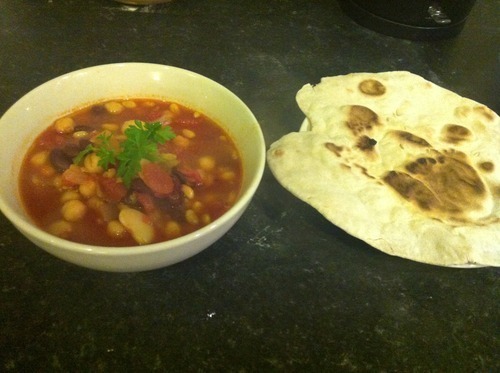 The original recipe says 100g broad beans – but I used kidney beans instead as I am not a fan of broad beans. I also omitted the two sticks of celery as I didn’t have any at the time. Fry onions in oil on low heat until soft (around 10 mins). Add cumin and cook for another minute or so. Add lemon juice and cook for another few minutes. I then left this to simmer on low for another 15 minutes or so, until the kidney beans softened. Mix all ingredients (by hand or in a food processor). If the dough remains too wet, add a little more flour. Knead the dough on a lightly floured work surface for a minute or two to bring everything together. Heat a pan on the hob, making sure it is very hot (a griddle pan if possible). Once it is really hot, cook for a few minutes on each side until puffed and until lightly browned. These are a perfect accompaniment to the Moroccan chickpea soup or with something like homemade pesto, guacamole or hummus.